What is a Double Hammer? 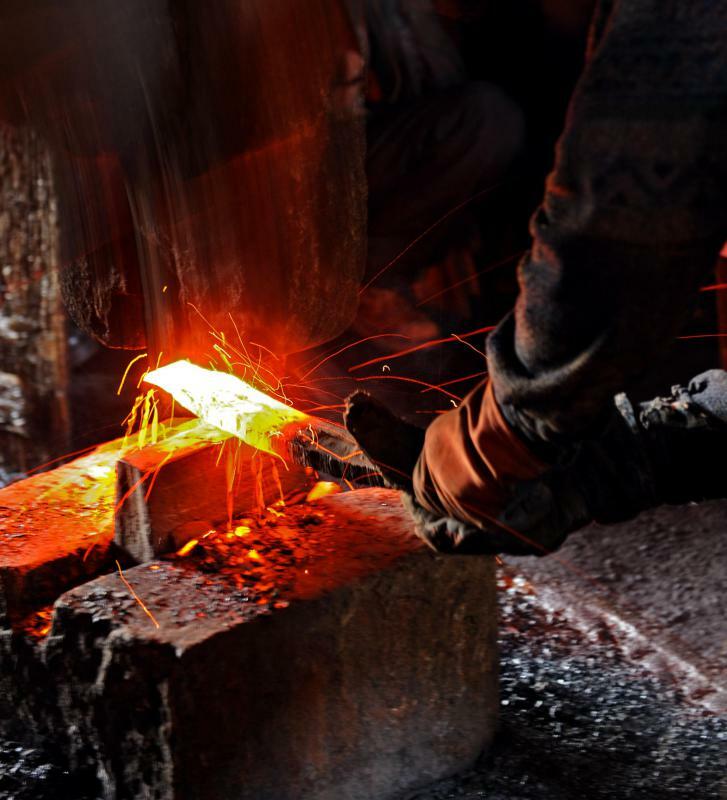 When a double hammer is used to shape a piece of metal it is known as smith forging because it is a technique used by blacksmiths of old. A double hammer is a two-faced metal forging implement, meaning it has two different heads that can be used to strike an object. They can change the shape of or add texture to a metal object. Double hammers are used to create many types of metalwork, from sculptures and jewelry to the metal framework that forms the basis of a building. The ball peen hammer is an example of a common double hammer used as a metalworking hand tool. To make a double hammer, a wooden, metal or polycarbonate handle is fitted with a weighted striking head at each end. Often, a double hammer will have one textured head and one flat head, allowing the user to both mark and flatten the metal. Depending on the type of work being done, double hammers can be small and relatively light with a delicate handle or thick, large and heavy. Generally, the smaller the metal pieces being worked, the smaller the equipment, including the hammers. One metalworking technique in which the double hammer is commonly used is forging, where metal is shaped by compression. Metal can be forged using a wide variety of techniques; most commonly these include drop forming, press forging and induction forging. When a double hammer is used to shape a piece of metal, this is known as open-die drop-forming. This type of forging is also known as smith forging because it is the technique used by blacksmiths of old. Many two-faced hammers have different texture patterns on each head. When put to use, each double hammer face pattern leaves a different impression on the metal surfaces it contacts. The face can be used to mark metal, shape it or flatten it. Double hammers are useful for shaping both hot and cold metal objects, but it is important to get a hammer made of a material that can withstand the heat levels given off by the metal. Double hammers are one of a wide variety of tools used to mark and shape metal. Other types of hammers used in metalworking include those designed to be used with chisels, or hammers that act as picks. Although hammers are still used for some forging, depending on the size of the work piece and the type of material, other tools may be more efficient. What Is Open Die Forging? What is a Schmidt Hammer? What is a Hammer Tacker? What is the English Wheel? What is a Forge Hammer? What is a Warrington Hammer?